Part of Sabalito along the paved Tierras Morenas road. 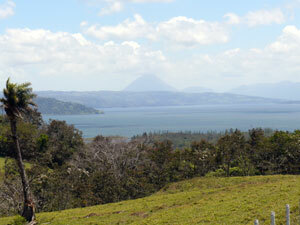 Lake Arenal is seen here from a lot above the Tierras Morenas road. 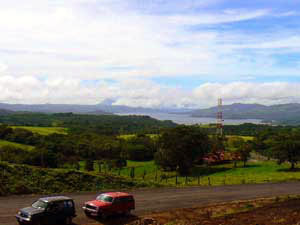 Sabalito is a village located very high above the lake at the northwestern corner and thus many of the properties have views down the lake to the Arenal Volcano. It is reached by a very good paved road that curves uphill from the lake road and goes on past Sabalito to the picturesque ranching village of Tierras Morenas, where the pretty church features a statue of Christ as an oxen driver and the annual fiesta features boyeros or oxen drivers, their handsome, patient and powerful teams of oxen, and the sometimes colorful carts for which Costa Rica is famous. Between the lake road and Sabalito is the Mystica Lodge where its Italian restaurant is a fine place to enjoy a vast lake vista over your pizza. There are existing homes for sale as well as lots in a couple of developments, where you can have your choice of views of the lake and the northern volcanos or sunset views to the west over Tilaran and the Guanacaste lowlands. Some of the residents here are windsurfing aficianados, since it is not far to the Ticowind and Tilawa windsurfing centers. 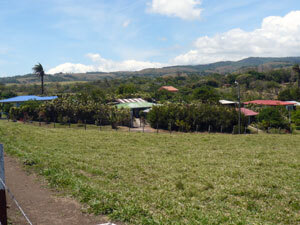 A45 35-acre finca with large spring-fed pond, great building sites, forest, vistas. Make offer. A30 2.27 acres just above lake before Sabalito road, $138,000. Arenal Volcano from a spot below the village. 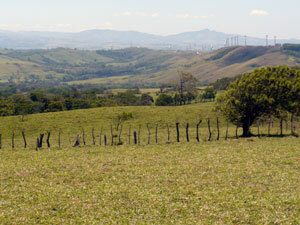 The turbine-topped hills leading to Parcelas.